I have been waiting for this review and it is just on time along with the Lodgy launch. My two previous purchase temptations did not result in successful completion. Mobilio - Cheap interiors & High pricing. So I decided to go slow on the bookings this time around. I shared my views of the Lodgy in an earlier post, here, so nothing new to add here. But I would like to comment on the 2nd row leg room. According to me, it is not bad. I'm 6' 1" and I found the 2nd row leg room to be a problem only when the first row seats is pushed all the way back (as I prefer to drive that way) and if you are seating 5'11"+ people in the second row. Most of the front row occupants might not push the seats all the way back. Agreed, Renault should have at least offered the sliding functionality for the second row too. End of the day, why not give sliding seats here and let the actual passengers choose how they want to split the room up (between the 2nd & 3rd rows)? Why should middle-row passengers get compromised legroom when the last row is empty? This is the single biggest disadvantage of the Lodgy. Chief competitors - the Innova, Ertiga, Mobilio - all offer a sliding middle-row for the greater flexibility it provides. If I remember correctly, Mobilio offers the sliding middle-row only on the top variants (V models). Because the captain seats are fixed, legroom is mediocre. Tall passengers will definitely find it to be limited. The problem is compounded if there is a tall occupant on the front seat. To put things in perspective, legroom is comparable to an i20 / EcoSport. The Innova is in a different league altogether, offering significantly superior space when the 2nd-row is pushed behind. Lodgy owners would do well in looking for seat sliders in the aftermarket. It shouldn't be too difficult to implement. Can the sliding functionality be implemented aftermarket? Does any BHPian know of such a job done which is posted in the forum? Excellent review gentlemen! Really loved the pictures in terms of image quality. I don't understand why people are bent upon beating Innova while previous market trends show that Innova and other MPVs can comfortably co-exist without one eclipsing the other. Case in point? Check out the Ertiga and Innova's sales figure for the last year: give or take a few 100s but they co-exist with near identical sales figures. That tells me they cater to different markets and this is a segment where players can co-exist, provided they get the pricing right. With the Lodgy, I reckon a similar trend will continue and I don't see a reason why the Lodgy has to be an "Innova beater" which I reckon it isn't because of the varied approach each have taken to market their product. There is a huge gap in the 10-15 lac range that Toyota cannot cover with its Innova and this is Lodgy's playing field. One doesn't have to beat the other to exist in this segment is my humble opinion. Quite right, they were the 504 & 505 ! Thank you for pointing out the slip! - in today's scenario when we are drowning in new releases every other day, I find myself making this kind of automotive malapropism now & then. 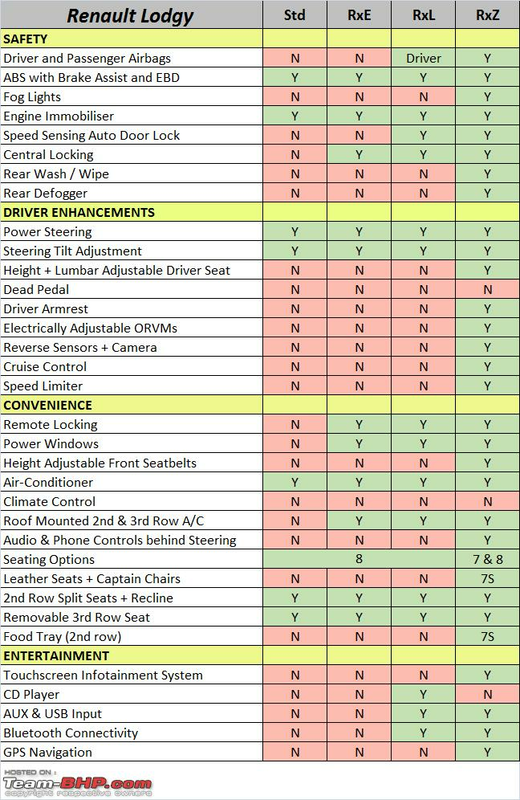 One question though,I couldn't find any reference to availability of airbags although i saw in one of the pictures that the steering wheel has an airbag. What about front passenger, is there one or only the driver gets the airbag? Sorry about that. We'll be uploading a features sheet shortly, showing the differences between the variants. Because of the fake news that circulated earlier saying that the Lodgy will only be launched in the top trim, we didn't prepare it in time for the review. Is it that you get invite for the event well before the launch date because from the attention to the detail it definitely looks like a week of effort ? I can assure you it's more than week's worth of effort . 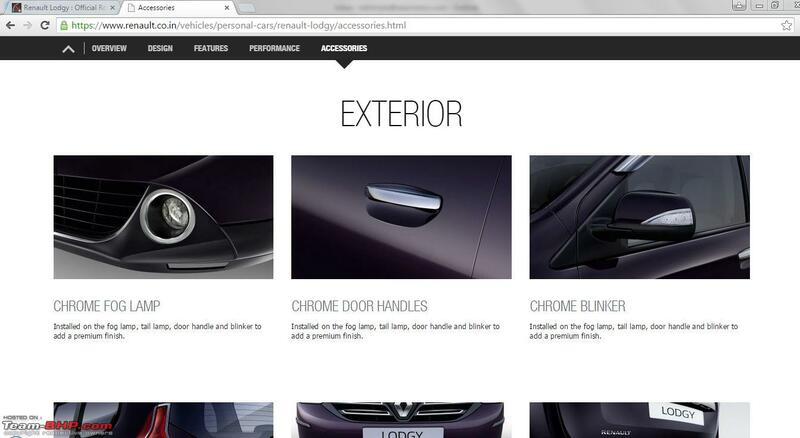 I wonder how the company can offer chrome as accessories for its ORVMs blinker for there is none! 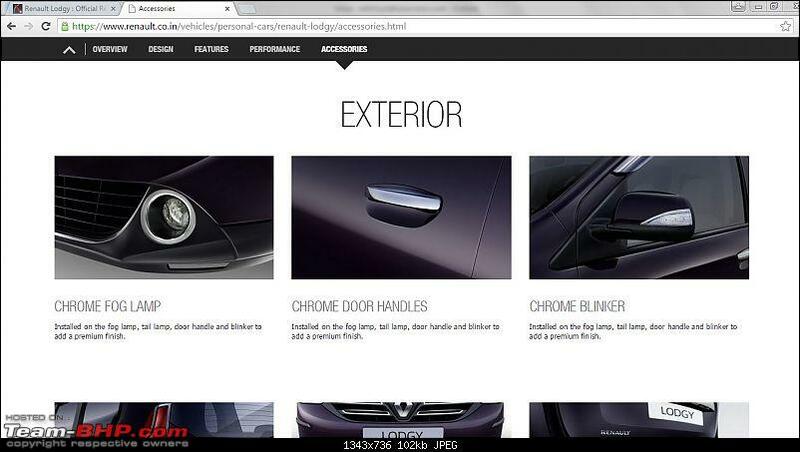 The official website mentioned that it has chrome for the blinker. Thanks for the precise review as we all now (unduly) expect from you guys. The pics where Vid(?) is sitting in the 3rd seat legs fully stretched and the middle row tumbled away may be the best way to travel. I can imagine a driver driving to some aimless destination and a cooler of "stuff" with a few good friends. Wanted: Drivers who are 5 feet or shorter. Overall, an excellent package with good fuel economy, NVH and all round amenities. I am sure it will be hard to ween away from the Toyota quality bandwagon but if Renault plans the post-sales support properly, they will have a hit on their hands. I am glad we have a competitor for the Innova and if Renault even comes within sniffing distance, Toyota may react with an updated / new model. It's in Renault's best interest to take a leaf out of Tata's Lessons Learned document and split the taxi and passenger segment after sales service and support. We tested it much before launch. It is quite possible that based on feedback they decided to do this. Lets see an actual vehicle to take a call! The cars we got were PPP's or Pre-production prototypes. Renault had told us that final cars may have small differences to what we see here. Or may be they are yet to update their site with this feature of blinkers on ORVM. On the other hand, the accessory featured itself could be "Chrome with Blinkers" fitted onto the ORVM just like illuminated side step garnish as an accessory! 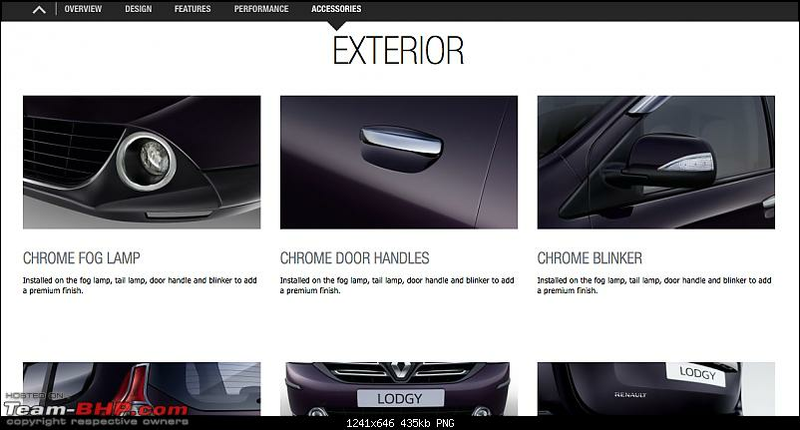 Lodgy's brochure is also uploaded now on the website. Attaching the same here. 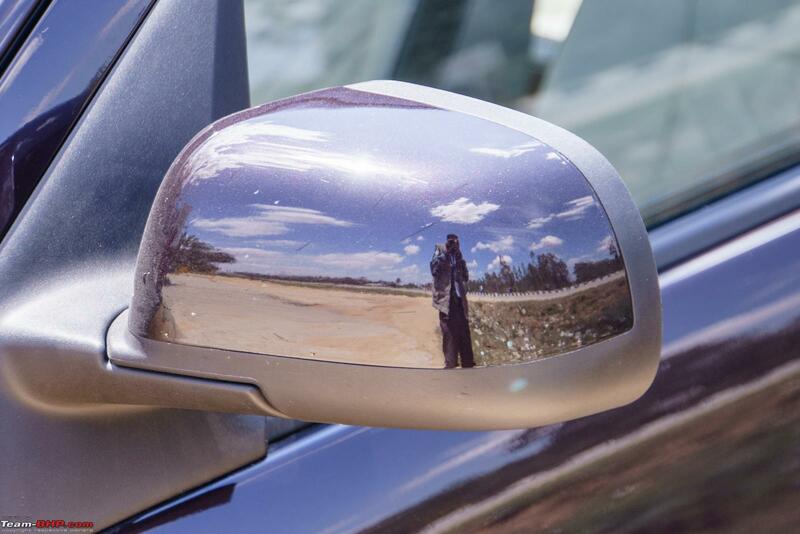 At last a worthy competitor to the Innova, if not the new king of the segment. The outstanding drive quality, quiet cabin and a gem of an engine make this a winner. As for the missed out things, I guess they can be overlooked time being. A well deserved win Renault! The screenshot that I put was from the site and not from the accessories section. 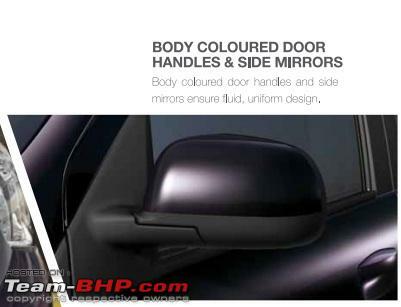 The pic of the Lodgy on the site doesn't have blinkers on the Indicators. The point I was trying to make was that none of the variants may have the blinkers on ORVMs and the accessories may have chrome lining along with the blinkers as a bundle. Thanks to S2!!! 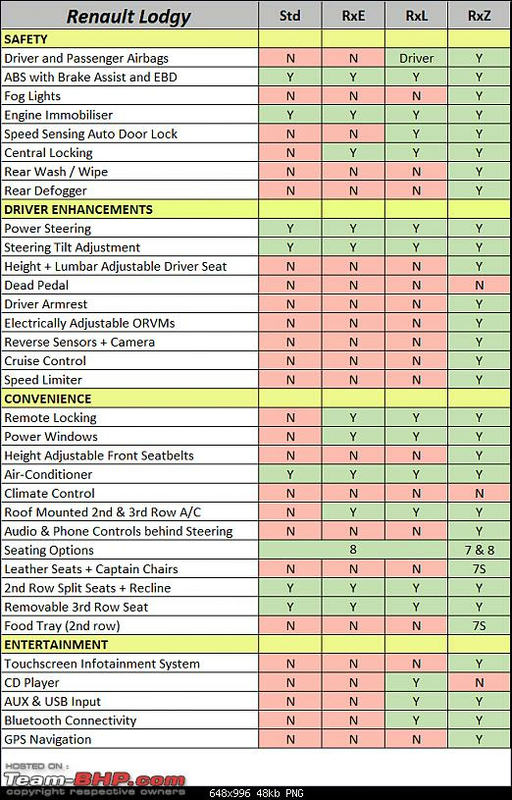 for compiling this useful feature comparo sheet. ABS is standard across the range . All times are GMT +5.5. The time now is 02:07.